My original "kitchen table" brainstorm. The Packard Foundation asked me to write a blog post about our 2016 staff restructuring (which they supported with a capacity-building grant). Here's that post, lightly edited for your enjoyment. You can read the original post on the Packard Foundation's Organizational Effectiveness site. I sat at my kitchen table with a brown paper bag, timer by my side. I sliced the bag open and folded it into 12 rectangles, each about the size of an index card. I set the timer for five minutes and started working. In the first rectangle, I sketched out one version of how our organization could be structured. When the timer dinged, I reset it for five minutes, moved to the next rectangle and did it again. After an hour, I had 12 different versions of our staff structure, each in its own little box. Some were impractical. Some were poetic. But among them lay the seeds of our museum’s future. By the time we applied for a Organizational Effectiveness grant from the Packard Foundation in early 2016, it already felt late. 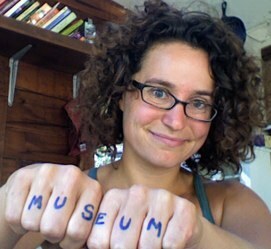 Our nonprofit museum had outgrown our grass roots. In five years, what was seven staff members when I arrived became 10, then 15, then 20 – and is now 27. When we had seven people, we barely needed an organizational chart. We were a scrappy band of creative folks trying to turn around a struggling organization. As we succeeded, we grew. But I resisted structure. I was wary of too much process. And so we stayed egalitarian and collaborative. It got chaotic. Almost everyone reported to me, and that caused frustration and bottlenecks all around. I was knee-deep in a capital expansion (Abbott Square) that would dramatically change our services, and I had less and less time for everyone. I knew that our smart, talented, wonderful staff could do more. I knew the capital expansion would mean new roles and functions. Our team deserved a new structure that sustained and empowered them. I was scared. I had never heard anyone at any organization say, “that re-org sure was great!” They always seemed to bring even more confusion, frustration and pain than whatever had preceded them. I didn’t know whether or how we could do it well. I was also suspicious of consultants (the Packard Foundation funds capacity building largely by paying for consultants). Running a small, unorthodox nonprofit, I’d had bad experiences with consultants who didn’t seem to give us their full attention. They wanted to fit us into their boxes instead of helping us excel in ours. My fears about consultants were allayed when I realized we had a consultant whom we trusted and really knew us, Keri Crask. Keri was like a hidden Jedi consultant. She was a retired HR executive and a treasured museum volunteer. She had volunteered to run management trainings for staff as we had started to grow, and she had become a trusted confidant to me and to some of my colleagues. At the time, she wasn’t consulting. But we realized that she could help us execute a reorganization, and she realized she wasn’t quite ready for full retirement. And so, with the blessing of our Board, Keri and I worked together on a plan. Over the next six months, with Packard Foundation support, we worked out a plan for a reorganization with two lead staff members, Stacey Marie Garcia and Lis DuBois. 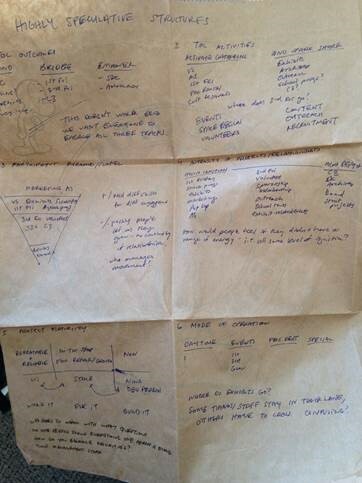 I brought creative vision in the form of folded up pieces of paper with wild ideas on them. Keri brought structure and expert knowledge about how to coordinate the change. Stacey and Lis brought openness and honesty with regard to how their roles would change as they evolved into new director-level roles. And we all brought courage – lots of it. I spent some time alone at my kitchen table at the beginning of the process, but quickly, planning the reorg became a team sport. At Keri’s urging, we first mapped out a new structure for the organization, one that could scale if we grew (which we did, almost immediately). We defined “buckets of work,” putting them in departmental groupings, noting the intersections. We shaped those buckets into jobs. We kept our eye on our core values and how to bake them into the departments, jobs, and interfaces among them. It was a full six weeks of work before we started talking about names of existing employees and tentatively slotting them into roles on the new chart. When we started this project, I expected about 30% of the museum’s jobs to change a little bit, and about 20% to change a lot. As it turned out, everyone’s job changed. Some people changed managers. Some people changed responsibilities. Some people changed jobs. Everyone changed titles. Executing these changes was the most coordinated, interlocking, emotionally-intense activities of my career. Stacey, Lis, and I held conversation after conversation, one-on-one and in groups and just us, each dependent on another, urged and cheered and supported forward by Keri. Was the re-org perfect? Of course not. It was a challenging process, and the challenges continue to surface from time to time with our staff. But it was better than I could have expected and ultimately made our organization stronger. In Keri, we had an expert guide who had rafted that whitewater before. She kept us going to the finish line, and she helped us grow as leaders and as an organization along the way. What have you learned from the re-orgs you've been part of? What were the bright spots? What were the surprises? It's 8am in the classroom; 5am in my body. I'm sitting at my assigned seat, next to a man who sells trailers in in Indiana, a woman who runs a Chamber of Commerce in Pennsylvania, and a guy who provides liability insurance to doctors across the US. A cheerful curly-haired deli owner stands in front of 30 of us and shares a quote he loves: "Artists live in the present and write detailed histories of the future." Something tells me this is not the business visioning workshop I anticipated. Last week, I attended a workshop on Creating a Vision of Greatness at ZingTrain, the training arm of Zingerman's Deli, in Ann Arbor, Michigan. Zingerman's is a deli that has pioneered some innovative ways of doing business. One of those is the use of visioning (also called future-casting). You can write a vision for yourself, your organization, your project, or your team. At the training, we saw examples of small visions--like a restaurant barback who had a vision for a better way to make juice--and big ones--like the 10-year vision for the 700-person Zingerman's community of businesses. We learned how to write visions, how to use them, and how to share them with others. For me, writing a vision was empowering, exciting, and useful. It was even more useful to learn how participatory writing visions can be. In the Zingerman's model, visioning is for everyone at all levels of the organization. It's for anyone who wants to go somewhere in their day, their year, their life. Writing a vision can empower you, clarify your thinking, and help you change the world. So here are a few notes on how to write a vision. If you want to know more, I recommend you check out the related ZingTrain articles on visioning, or even take their two-day course. A vision is not a solution to a problem. A vision is a detailed history of the future. It's a story written from the vantage point of a few months or years from now. It's a story of what happened after you launched that program, gave that speech, conquered that challenge. What does the world look like in that future? What's different about your life, your work? That's the story a vision tells. A vision is a story. Write it that way. Write your vision with as many specifics as possible, in narrative form. This is a detailed history from the future. Imagine you're seeing an old friend after a few years, telling them about all the amazing stuff you've done since you last met. Use evocative language, engage the senses, engage your emotions. Make it a positive vision. Put in everything you want to see happen--even if it seems impossible. Don't focus on how you got there. Write about where you arrived. Before you start writing your vision, write a list of things you are proud of, in any part of your life. The goal here is to write down as many as possible. You'll warm up your hand and get yourself in a positive frame of mind. Use the "hot pen" or automatic writing technique. Start writing, and don't stop--for ten minutes, thirty minutes, whatever you need. If you get stuck, write nonsense words. Don't take your pen off the paper until the time is up. When you break through stuckness, you might be surprised what you find on the other side. If you get stuck thinking about the steps to achieve a certain part of the vision, write your way out of it. Imagine you already figured it out. Write something like "It took awhile to raise the money, but once we did, we had even more than we needed." If you're focused on big picture goals, cast your vision far enough in the future that you're on the other side of all the obstacles you face today. The trainers suggested writing a vision 5-10 years out, and they encouraged us to go for ten if we could. Dial up the "want." Put in everything you want to see happen. If you want a hot tub in the staff break room, put it in. Don't put in the stuff you're supposed to want. Put in what you really want! No one else is going to guess what you want, and this is your vision. This is your dream. Put it all in. --share it. Get feedback on what parts feel alive and compelling, and which parts seem cloudy or forced. If it's a vision for a group, involve others in the group in the redrafting of the vision. They will make it better, and you will all feel greater ownership over the final version. We reconnected about a year-long (already-established) goal to improve our work experience individually and collectively. I briefly explained what visioning is and why it might be valuable for us. We took ten minutes to do personal, "hot pen" writing of a vision for spring of 2018. The prompt was to write a detailed story about a day in spring 2018 when we are working even better as a team (whatever that means to you). We all wrote for ten minutes straight. We paired up, shared our visions with a colleague, and wrote down things we heard that excited us. We shared those energizing elements with the whole group. These included ideas like "musical chairs job shadowing," "foot massage conference-call room," and "more meetings in public settings." A small group volunteered to take this work forward to establish a shared vision we can then use to guide us to more collaboration in the coming months. I'm not sure yet if visioning will become a go-to tool for me or for the MAH. But I'm going to keep trying it. And I hope you will try it too. In fact, I have a vision for one month from now. It's a Thursday morning, I'm scanning emails, and I'm delighted to get a note from you. After reading this post, one morning, you woke up early, grabbed an old journal, and started writing. You wrote a vision for that big dream of yours coming true. You wrote yourself into a position of agency and leadership. You wrote yourself overcoming obstacles to reach your goal. You wrote a future that is more beautiful because of your efforts. And you shared it with someone. You enlisted them in helping make your vision real. You wrote to me to tell me you tried it. It was uncomfortable, a little weird, but empowering too. I'm looking at my screen, smiling with appreciation for you. The Museum 2.0 blog started because of a conference. In 2006, I attended a big conference for the first time (ASTC). I went alone, sent with a blessing from my boss at the International Spy Museum. I dutifully went to sessions all day, every day. I saw speakers who dazzled me and filled my notebook with their words. But I was shy, painfully shy. I talked with almost no one at the whole event. All those hallway conversations people say are so valuable? I had none. Instead, I went home and started this blog. Then, I started emailing posts to those speakers who I'd admired. I was offering them a clumsy gift--ideas they had inspired in me. Writing the blog helped me connect with them, but more importantly, it gave me the confidence to show up at conferences with something to say and a reason to connect. Fast forward a couple years and I was a conference junkie. I reveled in big events like ASTC and AAM. I loved flipping through conference programs weeks in advance, inking stars by sessions I wanted to attend. I loved the options and the energy. And I had rules for myself: always pick a backup session in case the first one is lousy. Attend at least one session that you know nothing about. Have the courage to meet people who fascinate you. Find ways to bump into them again and again. Learn from them. Give them something of value. Become their friends and invite them to be your mentors. As Museum 2.0 became well-known, I started building a tribe of people I loved to see at these events, and even better, new interesting people kept presenting themselves to me. I hardly needed the social courage I'd worked so hard to cultivate. Conferences became an essential way for me to connect with friends, do business, and learn. I hosted sessions during the day and expanding dinner parties at night. I started to see generous mentors everywhere. I had good questions to ask them, and they had valuable advice to share. Fast forward a few more years, and now, conferences were ALL about connecting with people. My tribe felt full and fully satisfying. Conferences took me around the world. But with the exception of a few unorthodox retreats, the events themselves became sidelines to the social connections. I'd give a couple talks, sell some books, but otherwise, I hardly glanced at the program booklet. I spent all my time meeting treasured colleagues in hallways, coffeeshops, and late-night karaoke crawls. We found ways to hack the formats to spend more time with each other. I learned from my friends, but I felt increasingly antagonistic to the pomp and bureaucracy of the conference itself. I wasn't getting value from it. It was just a vehicle to get me in the same city and room with people I loved. Two years ago, I stopped going to conferences at all unless I was being paid to speak or required to attend. When I did go, I found good people, but also, tiresome trappings: big rooms, bad lighting, deadening panel discussions, an endless stream of honorifics squeezing the clock. I stopped feeling inspired and energized by them. I found ways to make the trips meaningful--usually by staying with treasured colleagues and all of us agreeing to play hooky and do some real work together. I felt frustrated that I couldn't just go with them on a trip to learn together. The tax we had to pay to do so was to attend a conference. It felt like an steep tariff on our growth. So what to do? I still love to learn, and I love to learn with others. I didn't know where or how else to do it. I started reading books voraciously, which is great, but solitary. I dabbled in webinars--they were mostly terrible. Then about six months ago, I stumbled into a professional training environment. And I fell in love. The first training I went to was on Public Narrative, led by master facilitator Sarah El-Raheb. Public Narrative is an activist storytelling technique for rallying others to your cause. I experienced a 2-day training with a group of fellow grantees sponsored by the Irvine Foundation. It was incredible. It was intense, extremely well-facilitated, and meaty. There was a workbook full of useful content. The process was distinct and well-documented. It was like learning another language. I was fully engaged, I worked hard, and I got outcomes from it that I suspect I'll use for many years. The other people in the workshop--there were about 40 of us--were definitely part of the process and the experience. But for me, it was an intense personal learning experience, couched in an energizing social environment. When I went out for dinner with colleagues after a full day of training, I enjoyed our time together. But I didn't need them to make it a worthwhile trip. I felt wrung out and full from the training itself. I felt the same way about the training I just experienced this week. I went to Ann Arbor for a training on Visioning led by the co-founder of Zingerman's Deli, Ari Weiszberg, and master trainer Elnian Gilbert. There were 30 of us in the room, from a mix of small and mid-sized businesses around the US. There were trailer salesmen and insurers and cheesemakers. The people were interesting--many came from contexts completely foreign to me--but the value was in the training itself. Again, the content was rich, deep, and focused (I'll write more about it next week). We did hard work throughout the two days, drafting long-term visions for our respective organizations. I learned a lot, and I know I'll keep building on what I learned. Ari shared his vision that we would become converts to the Zingerman's visioning methodology. It's easy to imagine this might happen to me. Outside the training room, I had a great time with my friend Nick, who came from New York to join in on the learning. We biked and ate and wandered and worked. Doing the training together added real value to the experience. But again, it felt like the training was rich and valuable no matter what. It wasn't like a conference, riding on the fumes of friendship. What do I take from these experiences? Right now, I'm enamored of training. These training experiences are leading me to more breakthroughs than I've experienced in other learning formats. The content is highly targeted, the facilitation strong. I'm excited about pursuing other opportunities to learn, in groups, from experts with relevant content and methodologies. I'm going to one more training in 2017--this time, on my own--and I'm hopeful it will be the best one yet. But my ardor doesn't mean trainings are "better" than conferences. It's possible, if not likely, that I'm going through a phase in my professional learning and growth. At one point I loved conferences. I can imagine the day when I might feel that way again. I'm curious about the range of professional learning and growth experiences out there. I wonder how diverse the options are, and how I could identify the right opportunities for the right times in my life. I'm delighted to explore a new way I can learn and grow. I can't wait to discover others. What kind of professional learning is most meaningful to you right now, and why?